In my 30 plus years as an interior designer, I’ve always aimed to use “green” or sustainable products to create beautiful interiors for my customers. In the beginning, it wasn’t so easy. At one point, bamboo floors from China were considered to be the greenest thing you could specify. Thankfully, those days are far behind us, and designing with affordable and attainable green products now requires a lot less research on my part. Most manufacturers are on board with their sustainability message, and there are literally dozens of third-party organizations that verify the validity of green products, as well as government programs like Water-Sense and Energy Star. Local governmental agencies, like CARB in California, govern over the elimination of formaldehyde in products. Also, some green products can be found at local big box retailers, online, or even in your own back yard. So, with some thoughtful effort and research, designing a green and healthy home interior is no longer the arduous task it once was. The latest demographic research reveals that the two groups who dominate the buying power of homes today are the Baby Boomers and the Millennials. Their demands are similar, with slight variation. But both groups are definitely on board with sustainability. They both love the concept of open floor plans, smart technology, and energy efficiency. Beyond that, they also strive to cut their carbon footprint by making their home more accessible to transportation. They also want the ability to walk to local shopping and dining. This also relates to food preparation and consumption. The Farm-to-Table movement has spurred millions of people to seek local growers and organic food to enhance their already sustainable lifestyle. But this isn’t always an easy task, depending on where your project is located. I like to follow a simple rule of attempting to source out as large a percentage as possible of products made in the United States. This would include FSC certified lumber products in cabinetry. My goal is to specify any product that isn’t transported from overseas and also supports American manufacturers and increases jobs in this country. This can certainly become a challenge when it comes to designing kitchens and bathrooms, as a great deal of gorgeous products are made in Europe and beyond. And there is also the conundrum of exactly how much of an “American made” product is actually made in this country. At this juncture, I find the best approach is to seek out the highest percentage of American made or local materials as possible. The more American companies we support and promote, the stronger our economy will become, and eliminate tons of carbon emissions expelled by overseas transportation. As a green builder, marketing this strategy to your customers can be a great selling tool. Beyond that, as an interior designer, the home also has to be pretty. Combining both American made and pretty? Definitely possible! Here’s a list of some great products from American manufacturers that can make your next green build the best and prettiest one yet. Carlisle Wide Plank Flooring is a New Hampshire based company that produces beautiful custom wood floors in many finishes and wood species. From solid to engineered flooring, this company uses only American made lumber from managed forests. Crossville Tile is a Tennessee based tile manufacturer with an impressive sustainability message. Not only are their products made in this country, but they have the capability of recycling tile that’s been removed from demolition sites through their “Tile Take Back” program. Also, they partner with TOTO® USA sanitary wares to recycle pre-consumer fired porcelain into raw material for new tile. Crossville has become the first net consumer of tile waste, diverting millions of pounds of waste from landfills. Strasser Woodenworks based in Woodinville, Washington, manufactures beautiful custom bathroom vanities. For over 30 years, the designers and woodworkers at Strasser have built high quality bathroom cabinets from American hardwoods, including cherry, maple, red oak and alder. Their product line is sold in showrooms across the country. Quartz countertops are becoming increasingly popular, due to their consistency and durability. There are several manufacturers of beautiful quartz materials, but most are made overseas. Cambria, the only family-owned, American-made natural stone producer is based in Minnesota. Their slabs are also Greenguard certified for good indoor air quality. The reasons for buying American products are many: increasing jobs; guaranteeing fair and safe working conditions; insuring excellent craftsmanship and lowering our carbon footprint, to name a few. Seek them out for yourself, and try to include as many of these great American products as you can. Sustainability begins at home. 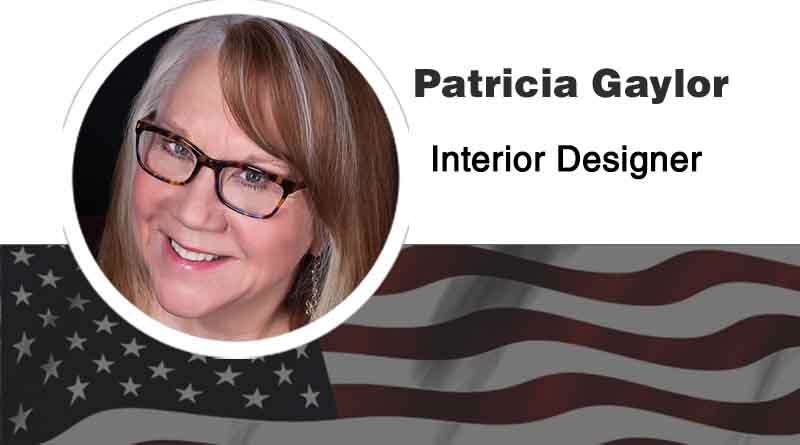 Patricia Gaylor, Interior Designer, Patricia Gaylor Interior Design, has practiced as an interior designer in the Northeast for more than two decades. She may be reached at www. patriciagaylor.com.